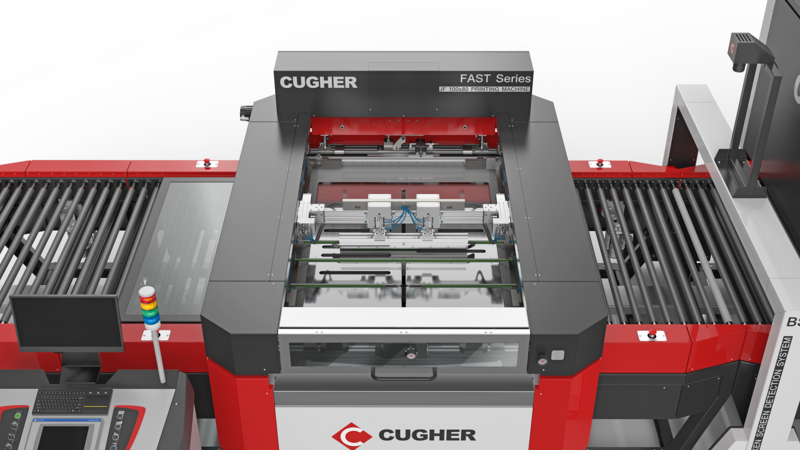 Cugher Glass, a Company based in Novate Milanese, just outside Milan, northern Italy, has been operating for 50 years in the production of machines and complete solutions for silk screen printing processes with high technological content. Now the company consolidates its customer oriented aptitude by optimizing the production of the new Fast line characterized by very high printing versatility, which is specifically dedicated to the Home Appliance sector. 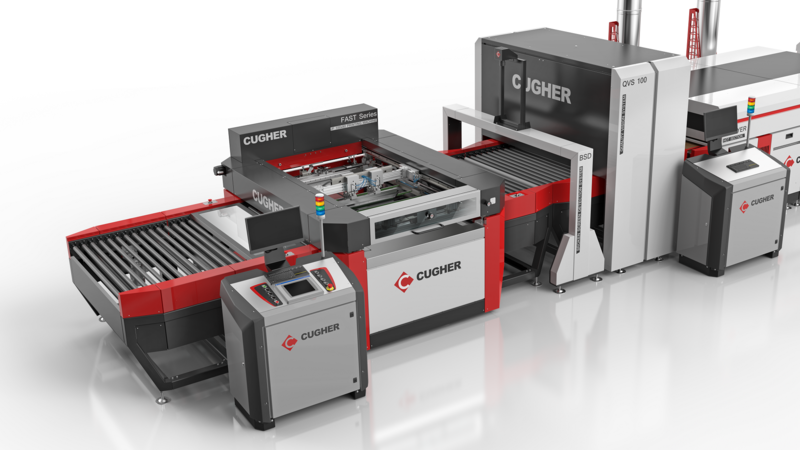 Cugher’s production, which is conducted by the Flexible Engineering driver, is ready to satisfy the emerging needs of the market, adapting its solutions in response to these trends: the production of each single component – hardware and software – is industrialized so that it can be subsequently customized and configured on the base of the contract specifications, without an excessive effort of resources. The Fast series is extremely rapid and offers excellent performances with regard to cycle times and production changes. The Fast series can print on both large and very small surfaces. 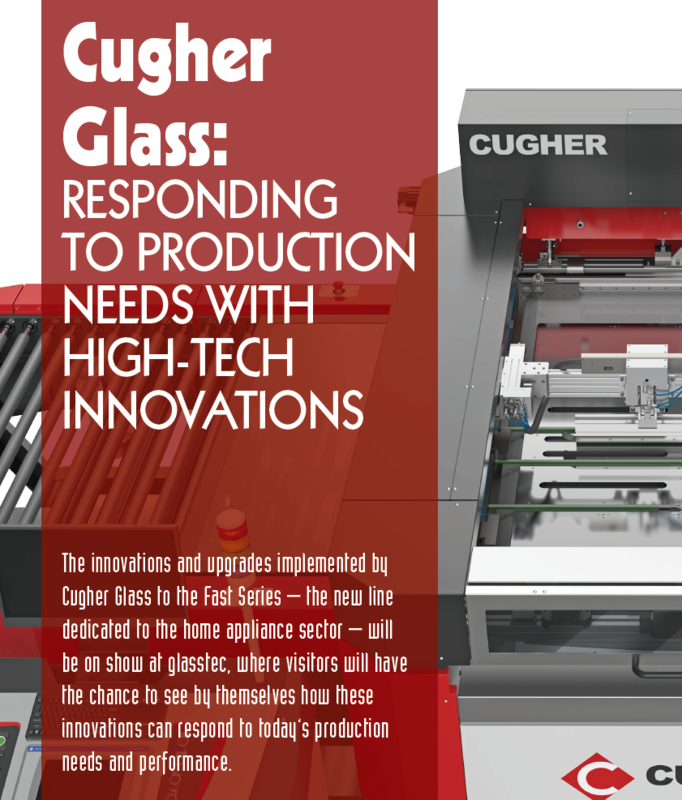 The format change is a basic task in the Home Appliance industry, where the requirements to change the type of glass to be printed is very common. The changeover can be carried out by a skilled operator in a few minutes, thanks to the selflearning system of the glass formats. Moreover, all the operations related to the different batches can be easily performed by a single operator on the machine. The very easy maintenance operations have been further improved thanks to some recent interventions on the design of the machine itself. Machine downtimes are very low thanks to reliable and high quality components. All machines are designed to be equipped with related options. • Constant pressure of squeegee bar and scraper, which can be set from the recipe on the operator panel. • Quick and easy frame registration, with micrometric precision on all directions, including rotation. • Adjustable height of printing head , depending on glass thickness and to make cleaning and maintenance operations easier. • Frame extraction without losing the registers and pneumatic locking of the same. • Cycle time: 6 seconds: with maximum glass size – 800 x 1,000mm – possible to print up to 600 glasses/ hour. 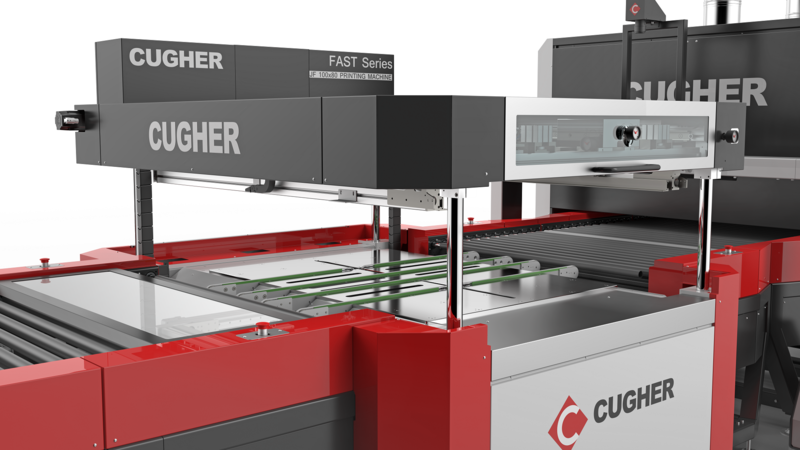 The proof of the continuous relationship with customers and of the attentive and constructive listening to the production needs coming from the sector, is the innovation content implemented by Cugher on the Fast line, improving its production performances. the bars have been modified so that there are no screws in contact with the glass even when the nesting plates start to wear out. The replacement of the nesting plates is done simply and quickly through dedicated knobs on the top. Motorized Peel Off adjustable from the operator panel: this functionality has been automated and now the setting of the peel off is done directly from the recipe. New nesting plates system on the printing table: the new nesting plates were built and mounted on the printing table to optimize the centring of the glass. New belts: The belts for glass movement are stronger and quick to replace. • Additional centring pins on the inlet conveyor: in the pre-centring phase they facilitate the perfect alignment of the glass before entering the printing table.• Antistatic bar on the printing bridge: it allows to eliminate all the electrostatic charges that accumulate on the frame during the passage of squeegee bar and scraper. • Sliding squeegee clamp: it is possible to slide the clamps on the printing bridge according to the dimensions of the squeegee bar. • New frame centring system: thanks to the integration of cameras in the printing table, the automatic centring of the frame achieves maximum precision and speed. • Ball glass lifting system for pre-centring of particularly delicate glass: it allows a perfect pre-centring, ensuring that the glass is not scratched.